Happy Year of the Pig! After eight days of preparation, the Chinese New Year Spring Festival is about to start. A full fortnight of festivities featuring Chinese musicians, dancers and performers will fill UK streets with colour and music, before drawing to a close on February 19th with the Lantern Festival. Why it’s great to be a Pig! The Pig is the twelfth zodiac animal, because according to legend, he overslept and was late to the Jade Emperor’s party! 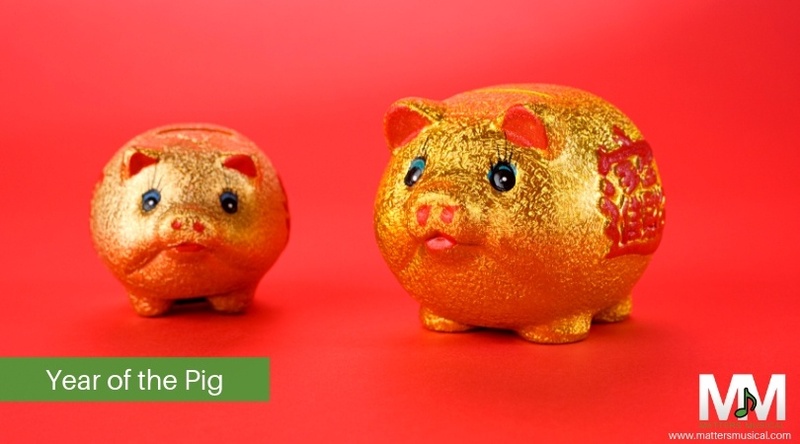 As the Pig is a sign of good fortune, those born in the Year of the Pig are blessed with a lovely personality and more than their share of good fortune. However, since Pigs are also very realistic, will take action rather than just talk, and will work hard to achieve their goals, most of that good fortune could be self-made! For Earth Pigs (1959 or 2019), this success tends to come later in life, and with the support of a wide circle of friends. So, who wouldn’t want to be a Pig! During Chinese New year, prayers are made to the gods for successful planting and a bountiful harvest. It’s also a time to warn off monsters with firecrackers on New Year’s Eve, and the let off some more the next morning to welcome the new year in. Before New Year, houses will be swept to clear out any old back luck. Nobody washes their hair on New Year’s Day, however, as this might wash away all the new luck! Many will avoid using knives or scissors to avoid any potential accidents. A crying child is also believed to bring bad luck, so families do their best to keep the kids happy all day long! Being with family is very important too, so millions of Chinese travel home for New Year’s even dinners. This causes the largest human migration on earth (!) as city dwellers head out to visit elderly relatives in the countryside in a migration known as ‘chunyun’. London’s Chinatown will be celebrating with the traditional parade on Sunday 10 February, complete with dragon and lion dances. Manchester celebrates with the Dragon Parade on 10 February starting from Albert Square, and a giant straw piglet in St Ann’s Square. Birmingham’s Chinese quarter is home to a variety of events from street food to workshops for children. Liverpool starts the festivities early on 8 February, for three whole days of festivities with a parade and many iconic buildings lit red in celebration. Other cities joining in the fun will be Newcastle, Bristol, and Edinburgh. Needless to say, our Chinese musicians, dancers and artists will be very busy over New Year, but may have a slot available if you want to celebrate in your own way! Thrill your restaurant customers with live music, treat your loyal clients to a Chinese New Year buffet with dancers, or just delight your workers with a ‘flash mob’ of firecrackers and a troupe of dragon dancers! Call us with your requirements. If you fancy making yourself some traditional New year dumplings, here’s the way to do it!